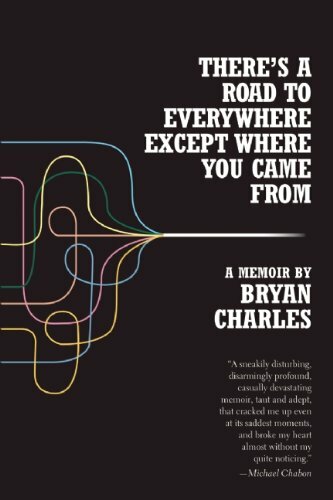 Bryan Charles’s There’s a Road to Everywhere Except Where You Came From opens with some words on its creation. “It was written with the aid of contemporaneous personal journals,” Charles writes about this account of his life in New York from 1998 to 2002. It’s an interesting note, in light of what follows, and one that helps to establish the episodic feel of this memoir. This is Charles’s third book, following the fine coming-of-age novel Grab On to Me Tightly As If I Knew The Way and a book on Pavement’s Wowee Zowee as part of Continuum’s 33 1/3 series. The latter of those was as much a work of autobiography as it was a work of music journalism, and serves as something of a companion piece to this book: examinations and dissection of different aspects of one life. There’s a Road to Everywhere… focuses on Charles’s life after graduating from college in Michigan and relocating to New York. Parts of the book deal with his relationships on his relationships: some successful, others painfully awkward, both in the experience of them and in the way that they’re recounted. Other chapters unfold as a sort of workplace farce, with elevator-bank crushes, copywritten revisions left in limbo, and awkward encounters in with coworkers defacing corporate bathrooms. His account of working for Morgan Stanley plays out like a comedy of errors — at least until the location of said workplace, on the seventieth floor of the World Trade Center, turns that workplace narrative into something very different. Wasn’t there anything heroic about confused and scared-shitless office workers keeping it together — banding together — enough to buck the odds and make it out alive? Charles’s account of the attacks make for the memoir’s most gripping prose. His account of the aftermath, of his temporary departure from New York and gradual estrangement from his family, stand as the memoir’s most emotionally challenging sections — a slow distancing arising out of good intentions. What unites the disparate elements of Charles’s book is, ultimately, the story of his development as a writer. And in many ways, the recent book that it evokes the most is, oddly, Dean Wareham’s Black Postcards. Both are warts-and-all accounts of the evolution of an artist in New York City. Neither Charles nor Wareham shies away from potentially embarrassing accounts of their life, and run the risk of being an unsympathetic narrator in the process. And yet it’s that candor that ends up enduring — in many ways, it’s that candor that’s led to the book before us.